Night Unison, the new Pokémon TCG Expansion! The night is drawing in as Tag Team GX takes a Dark-type turn in the latest expansion from the Pokémon TCG. We’re excited to Introduce SM9A, Night Unison! Released 11th January and available to order from Plaza Japan now, Night Unison is ensuring that the first set of 2019 is unmissable! With 55+ new cards to be found, SM9A features some seriously powerful Trainer cards and brings back some of the most popular Pokémon around ready to Tag Team up - Greninja & Zoroark GX! Whilst Greninja is one on the most popular Pokémon in general, Zoroark GX is one of the most-used cards in the TCG. This Tag Team combination has a GX attack so strong that it's named after the set itself - "Night Unison GX". This powerful GX attack allows you to put two cards in any combination of Dark-type GX or EX Pokémon from your discard pile onto your bench. If Greninja & Zoroark GX has at least one extra Energy attached to it (in addition to the attack cost of one Dark Energy and one Colorless Energy), you can even attach two Energy cards from your discard pile to each of those Pokémon too! That's the power of Night Unison! Joining Greninja & Zoroark GX in SM9A is one other Tag Team GX card and the reintroduction of two regular GX Pokémon. The other Tag Team GX Pokémon are another combination of popular and powerful Pokémon alike - the Fairy-typed Gardevoir & Sylveon GX! Without knowing too much yet, we're hoping that these new Tag Team GX cards also get the stunning new Alternate Art "SR" cards that seems to be exclusive to Tag Team Pokémon along with the standard Full Art "SR" and Hyper Rare "HR" rarity variants. The final GX piece to this SM9A puzzle is from Kanto! Venomoth GX is the last Pokémon available here in Night Unison. Moving on to Trainer cards and the new "TR" rarity (alternate art reprints of popular Trainers), we have four more to find. In SM9A, there are three reintroduced Items in the form of Electropower, Enhanced Hammer and Max Potion along with the Supporter, Guzma. Electropower would cause Dedenne's GX attack to hit for 80 too! After the reprinted Trainers, we of course have brand new ones! Six new Items arrive as Electromagnetic Radar, Startling Box, Pokégear 3.0, Secret Hood, Fairy Charm Lightning and Fairy Charm Ability, which all hit the TCG for the first time. With so many new Items, it's anyone's guess as to which ones we'll see in glimmering gold Ultra Rare "UR" form. Finishing off the Trainers as always is the Supporters, and we have possibly saved the most powerful card in the set for this moment! Firstly, we have a bit of a Fuchsia family affair! In the original Red and Blue games, the Fuchsia City Gym Leader was Koga, but by the time Gold and Silver had arrived, Koga had been promoted to Elite Four status and replaced by his daughter, Janine! 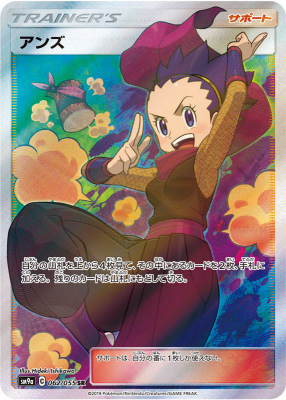 Whilst we think Pokémon have missed the perfect opportunity for the first ever "Tag Team Supporter", Janine and Koga's Trap are indeed two separate cards here in Night Unison and Janine has already been revealed as the first Full Art "SR" Supporter of the set! As always, the "SR" version looks incredibly beautiful – not to mention incredibly powerful. So, what is this almighty card we've been teasing in SM9A? Well as you may have guessed by now, it is indeed a Supporter. It is no less than the Lightning Lieutenant himself, Lt. Surge's Strategy. Not only is Lt. Surge a Kanto Gym Leader favourite, but this card also comes packed with so much substance. You can only play Lt. Surge's Strategy if you have more Prize cards left than your opponent, you may then play up to a huge three Supporters this turn (this card included). With an effect like that, has this card just rocked the entire TCG? One thing we know for sure is it's bound to be included in most decks from here on in! We can't even begin to imagine how sought-after a card like this could be as a potential Full Art "SR". Will your opponent make it through the Night? SM9A is proving to be one of the most compelling and forcible sets to date. The strength of Greninja & Zoroark GX, the Ability of Dedenne GX and the effect of Lt. Surge's Strategy could change the way the TCG is played for the rest of the Sun and Moon era. Night Unison is a set well and truly ready to take the game to the next level, so don't miss out and order from Plaza Japan today!